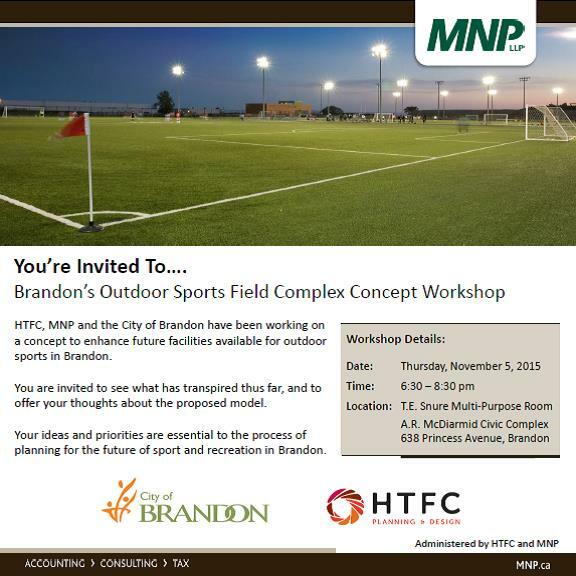 Brandon, MB – Members of Brandon’s outdoor sporting community and the general public are invited to join the conversation as the City of Brandon studies the feasibility of a new outdoor field sports complex in Brandon. Earlier this year, the City of Brandon and Province of Manitoba agreed to cost-share a $50,000 feasibility study on the viability of a new outdoor field sports complex to replace or improve upon the chronically-flooded Optimist Park. Administered by consulting firms, MNP LLP and HTFC Planning & Design, the feasibility study has included a number of workshops with various sport user groups and stakeholder organizations over the summer and early fall of 2015. With a number of possible models in hand, the City of Brandon has scheduled a public open house for the evening of November 5th, 2015, from 6:30 p.m. to 8:30 p.m. in the T.E. Snure Multi-Purpose Room of the A.R. McDiarmid Civic Complex, 638 Princess Avenue. Those interested in participating in the November 5th open house are asked to access the A.R. McDiarmid Civic Complex via the building’s south doors. Parking is available to the south of the building.